Rock Formations & Outcroppings in Wisconsin. Rock Formations & Outcroppings Adams County, WI. Adams County, WI. 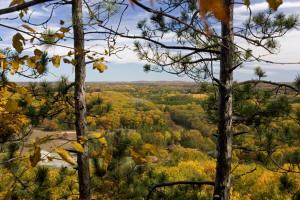 is located in the Heart of Central Wisconsin and has 23 well known rock formations. The most popular of all the formations is Roche-A-Cri Mound located just north Adams - Friendship which is the hub of the county. You can see Friendship Mound from main street in town. Adams County Rock Formations, Cliffs, Mounds, Bluffs & Rock Outcropping in alphabetical order. 1) Anderson Bluff - Is located in Springville Township, WI an is the only rock formation there. 2) Cottonville Rock is located at the western edge of Preston Township, WI. The Photo to the left is a picture of Cottonville Rock taken from the top for Roche-A-Cri Mound to the south. 3) D'oro Couche - Dyracuse Mound is located in Rome Township and is a hot spot for ATVs, snowmobiles, and dirt bikes due to Dyracuse Motorcycle Recreational Area. 4) Easton Mound is on State Highway 21 and was made into a wayside but the State of Wisconsin. 6) Friendship Mound is on State Highway 21 and was made into a wayside but the State of Wisconsin. 8) Horse Shoe Bluff is on State Highway 21 and was made into a wayside but the State of Wisconsin. 10) Keystone Rock is on State Highway 21 and was made into a wayside but the State of Wisconsin. 12) Lone Rock is on State Highway 21 and was made into a wayside but the State of Wisconsin. 13) Minnie Rock is in Roche-A-Cri State Park surrounded by hiking trails and even has 303 stairs to the top giving you easy access to those huge views. 15) Pilot Knob Bluff is on State Highway 21 and was made into a wayside but the State of Wisconsin. 16) Preston Cliffs is on State Highway 21 and was made into a wayside but the State of Wisconsin. is on State Highway 21 and was made into a wayside but the State of Wisconsin. 20) Roche-A-Cri Mound is in Roche-A-Cri State Park surrounded by hiking trails and even has 303 stairs to the top giving you easy access to those huge views. 21) Ship Rock is in Roche-A-Cri State Park surrounded by hiking trails and even has 303 stairs to the top giving you easy access to those huge views. 22) Spring Bluff is on State Highway 21 and was made into a wayside but the State of Wisconsin.